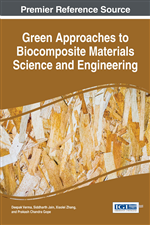 Green composites became a most important and adaptable theme of research. This area/theme not only harness the agricultural wastes such as bagasse fibres, banana fibres, etc. but also provides a new material manufactured from these wastes which are reduced weight, have low cost, and have high mechanical strength. Currently, there are various methods available for the processing or fabrication of green composites. Some of these methods are hand layup method, injection molding method, spray-up method, compression molding, Resin-Transfer Molding (RTM), etc. In this chapter, we are discussing about the fabrication method of green composite and their important parameters. Various properties and characterization of composite materials made by these methods have also been discussed and reported here. There are various methods for fabricating composite components to meet specific design or manufacturing challenges. The selection of appropriate method for a particular component, therefore, will depend on the part design, materials and application. Composite fabrication molding processes is used to shape the resin and reinforcement as per design. For an overview of methods used to make mold tools. Open mold processes include, hand lay-up and spray-up (chopping) (Verma, Deepak, et.al, 2015). In this process, a single-sided mold is used that acts as the form and cosmetic surface of the part. Gel coatis applied to the prepared mold surface and then reinforcements are applied either by hand and then wet-out with resin, or by the spray-up process where resin and chopped fiberglass are sprayed onto the gel coated surface. The additional laminate layer is added to build thickness and strength as desired. Air is then rolled out of the laminate by hand and the part is left to cure. In addition to reinforcements, low density core materials such as balsa wood, foam, or honeycomb can be added to stiffen the laminate without adding significant weight. Open molding is the most flexible of all composite fabrication processes as part size and design options are virtually limitless. Typically, the open molding process is used for a large size range of products that cannot be produced in more automated processes, or for parts that are produced in low volumes that cannot justify the higher mold costs of automated processes.